"India expressed its appreciation for Russia’s unequivocal condemnation of the terrorist attack on army base in Uri," a joint statement issued after the talks said. India and Russia on Saturday affirmed the need for “zero tolerance” for terrorists and their supporters even as Prime Minister Narendra Modi conveyed to President Vladimir Putin his appreciation of Kremlin’s unequivocal condemnation of the Uri attack during their talks on terrorism, including that emanating from Pakistan. “Russia’s clear stand on the need to combat terrorism mirrors our own. We deeply appreciate Russia’s understanding and support of our actions to fight cross-border terrorism, that threatens our entire region. 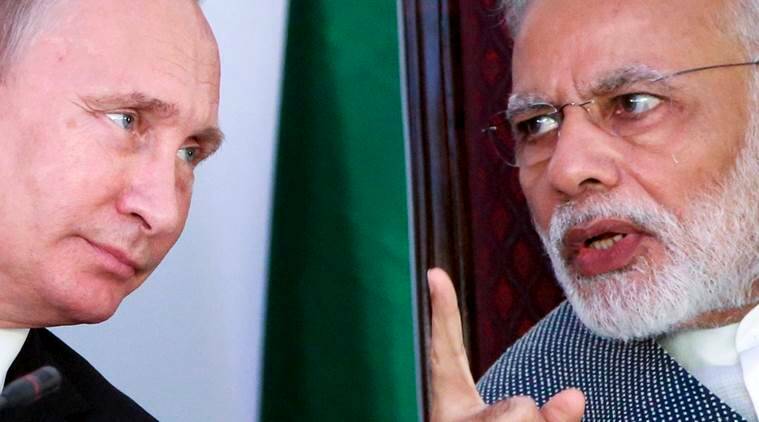 We both affirmed the need for zero tolerance in dealing with terrorists and their supporters,” Modi said at a joint media event with Putin after their annual summit in Benalium. Asked if the issue of cross-border terrorism emanating from Pakistan figured during the talks, Foreign Secretary S Jaishankar said, “The restricted form did cover Uri and support given for the terror strike (by Pakistan).” He said a more detailed conversation between Modi and Putin on the driving forces behind terrorism would take place at the lunch hosted by the Prime Minister. On his part, Putin said the two countries were closely cooperating in the fight against terror. “President Putin reaffirmed Russia’s continued commitment to the Special and Privileged Strategic Partnership with India and noted the commonality of positions of both the countries on such issues as war on terrorism. Indian Side expressed its appreciation for Russia’s unequivocal condemnation of the terrorist attack on army base in Uri,” a joint statement issued after the talks said. India, which has conveyed its opposition to Russia undertaking joint military exercises with Pakistan, a country which “sponsors and practices terrorism as a matter of State policy”, also said it was “satisfied” about Russia understanding its interests. “We are satisfied that Russia understand India’s interest and they will never do anything contrary to India’s interest and I think there was a strong meeting of minds on this subject,” Jaishankar said when asked about the Russian response to India’s concern over the recent Pak-Russia joint military exercise. The Foreign Secretary also asserted that the assumption of friendship with Russia, “which was more than a partner”, was that India trusts that they will not do anything contrary to its interest.